Another successful Ontario Welsh Festival is over! Although there had been twelve months of intense preparations and worry, we were able to smile contentedly as we acknowledged that the meetings, worry, hundreds of emails and phone calls had all been worth it. Betty Cullingworth was an exceptional president and no “i” was left undotted and no “t” uncrossed. That made for a flawless weekend. It also meant that every Board member knew what was expected of him/her and we all pulled out the stops. This year’s Guest Choir was Côr Cwmni Da from Pembrokeshire. Under the leadership of Marilyn Lewis this young choir was spectacular. Their soloist, Catrin Ann Taylor was an extraordinary 17 year old. Not only did she possess a superb soprano voice, she is a prize winning poet, a first class student and will represent the Urdd in Patagonia this Fall. The choir members and the friends who accompanied them were very sociable and participated in the Noson Lawen. And they certainly enjoyed the Afterglows! Marilyn was astonished at the singing during the Gymanfa, commenting that she couldn’t get over how well we knew the hymns and needed no books. Although during the past few years the afternoon Gymanfa session has been much weaker than the morning’s due to fewer attendees, this year’s session was excellent, thanks to the Pembrokeshire “friends” who lent such strength to the singing. And a special thanks to our organist, Alan Thomas. Over the years the Festival has grown to consist of several events. Greeters in Welsh costume welcomed attendees as they arrived and the formal events began on Friday evening with the annual Noson Lawen. This year’s was emceed by both Myfanwy Bajaj and Cerwyn Davies who introduced members of his former churches in Pembrokeshire. Saturday morning’s AGM discussed the possibility of having one extended morning Gymanfa session instead of the usual two sessions. However the suggestion was rejected and we will continue with the two sessions. The AGM was immediately followed by Awr y Plant (Children’s Hour) during which 13 youngsters took part. In addition to solo performances they again this year participated in Heroes and Heroines of Wales. Characters varied from the appropriately dressed pirate Barti Ddu to contemporary singer Charlotte Church. Thanks to all the parents and grandparents who “went the extra mile” to ensure that the children appeared “in character”. “Richard Burton” swaggered on stage sipping away from his hip flask!! “Tom Jones” wore a large curly wig, “Catrin Finch” (official harpist to the Prince of Wales) carried a large harp made from cardboard, “Santes Dwynwen” looked exquisite with her floral head-dress, the “sportsmen” were in appropriate garb and “singers” looked as “mod” as possible. Thank you so much, children. The audience loved you! A shortened poetry reading led by Myfanwy Bajaj preceded the Welsh movie “Cameleon”, shown by Leah Darke and Donna Morris . The movie tells the story of a young soldier during the Second World War who absconds from the army and hides in the attics of the Row Houses in his home village. The story examines the relationships that develop between the soldier and the various neighbours. No-one gives him away. An excellent, award winning movie. Then it was an enormous rush to get changed for the pre-banquet drinks. This year’s Banquet was a special event for Myfanwy Bajaj. She was the recipient of the 2012 Gold Award which is presented annually to the person considered to have contributed the most to Welsh culture and traditions in Ontario. It was especially “special” for two other reasons: a) her husband, Ram, had been discharged from Niagara Falls hospital after being rushed in there for a blood transfusion, and b) so many of her friends from home (Pembrokeshire) were there to witness her being honoured. The ceremony ended with Sheryl Clay Newell serenading Myfanwy with words written by Cerwyn Davies to the song “My Way”. In between the official events we spent time in the Market Place, drank tea and ate Welsh cakes and Bara Brith in the Tea Room, admired the history panels supplied by Catrin Brace, the Welsh Assembly representative in New York City and generally socialized with friends old and new-including representatives from NAFoW, Hywel and Mari Davies and Beth and Bill Landmesser. On Sunday Betty Cullingworth transferred the Chain of Office, gavel and Pittsburgh Bible to Meriel Simpson, thus ending her two years of presidency. And now it’s back to the grindstone! President Meriel Simpson called her first Board meeting immediately after the final Gymanfa Session. 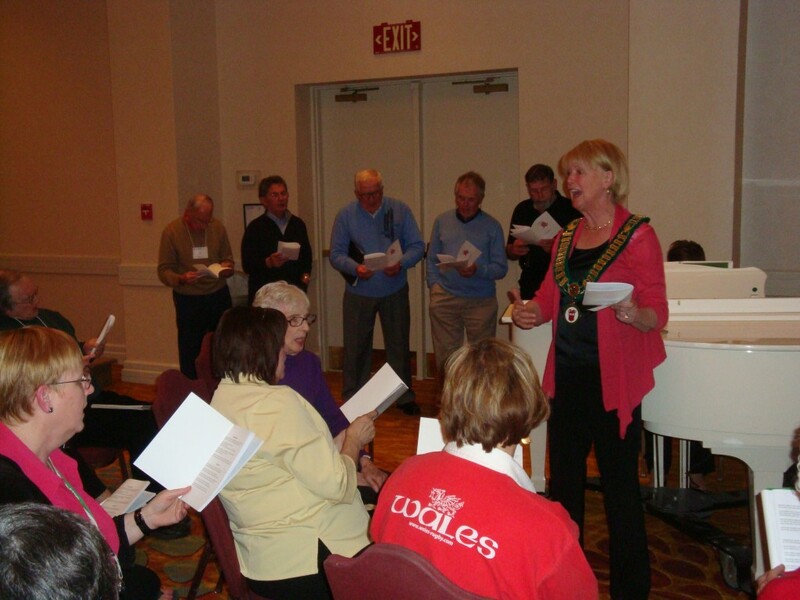 The 2013 Festival will again take place in Niagara Falls and the visiting choir will be Cor Meibion Taf, a Male Voice Choir from Llandeilo. A special “thank you” to everyone who supported the Festival in any which way this year.